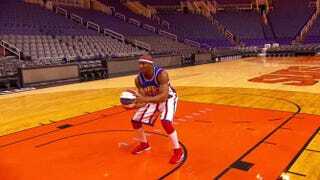 Setting world records is nothing new to Thunder Hall of the Harlem Globetrotters. Last year Hall set the Guinness World Record for the longest basketball shot, which was made from a distance of 109 feet 9 inches. This year Hall decided to outdo himself with a backward shot. Not only did he shatter the old record of 72 feet 2 inches, but he did it by setting it 10 feet farther, coming in at 82 feet 2 inches. And it’s all on video. The record-breaking shot on Wednesday at the US Airways Center in Phoenix was confirmed by a representative from Guinness who was on-site to see the event unfold. “Congratulations, Thunder, you are officially amazing,” the representative said after handing Law his verification plaque.